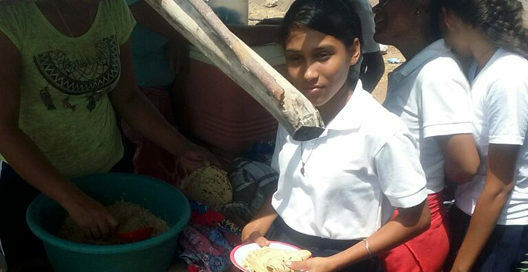 In March, with no rain yet to allowing planting, many students at La Carreta secondary school, Instituto Augusto Cesar Sandino, were not able to bring lunch to school and the school gardens were not yet producing. The school year of March – November had just started. The Ministry of Education (MINED) helps the elementary schools with basic lunch foods, but at the secondary level, in the past, parents with farms and gardens have donated food. Kids were hungry. From last year when the new school opened, the Delegada, who is like a district superintendent, and the teachers were looking for a way to entice the families to change from sending their kids to school once a week to every day. If they offered lunches, the parents (especially from the distant villages) would more likely accede to the daily program. They had already started that in 2017, using the “surplus” rice and beans that were left over from the primary schools’ supplies. But it was not consistent. 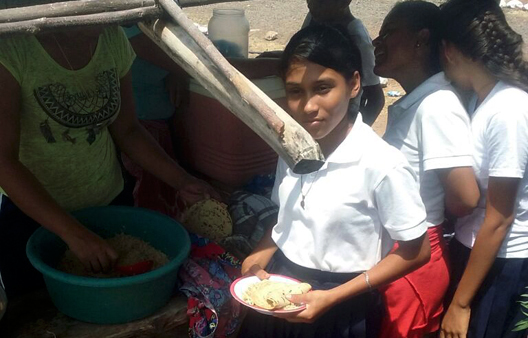 Although they had some rice and beans, anything more, such as the flavorings or tortillas, were only possible due to the teachers donating a few cordobas here and there. That is why at our March 13 board meeting, Somos Ohana Nicaragua’s directors made an emergency, short-term donation of $175 to allay the food shortage until the rains come and they can plant and harvest vegetables for improved nutrition. 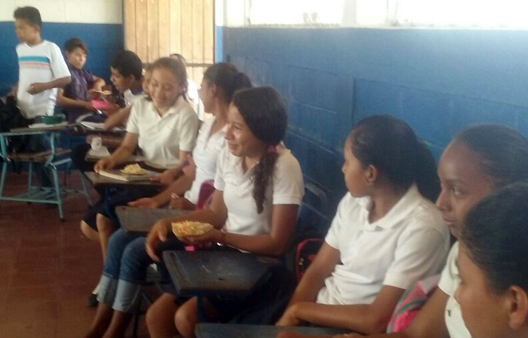 Students enjoy a meal, prepared at school and served in the middle of the morning, in one of the classrooms of the Insituto Augusto C. Sandino in La Carreta. The meal is at 10:30 AM, their normal recess time. Then they return to class for another hour. Some students stay on campus to do their homework until about 1:30. The heat is intense there, building up in the classrooms by noon, which is why school starts and ends early in the day in Nicaragua.